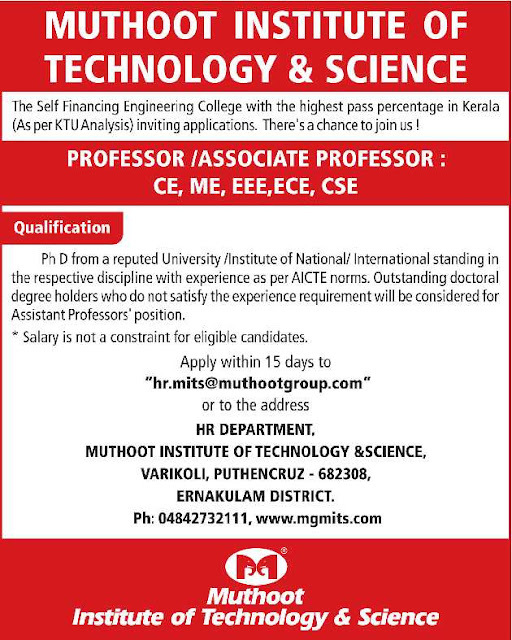 Muthoot Institute of Technology and Science, Ernakulam has advertised in THE HINDU Opportunities newspaper for the recruitment of Professor / Associate Professor jobs vacancies. Interested and eligible job aspirants are requested to apply within 15 days from 25th October 2017. Check out further more details below. About College: Muthoot Institute of Technology (MITS) is promoted by Muthoot M. George Institute of Technology, a Section 25 Company within the Muthoot Group. MITS, a self financing Engineering College is situated in the Industrial suburb of KOCHI close to the Smart City and Info Park, some 15 kms. from Vytilla Junction on the Cochin Madurai National Highway. How to Apply: Eligible and interested candidates are required to send application along with their Resume with Photograph and copies of certificates to the college email address or postal address mentioned below.